« The Wood In Moonlight: Full Moon. This is where they cut down the spruce forest last autumn. 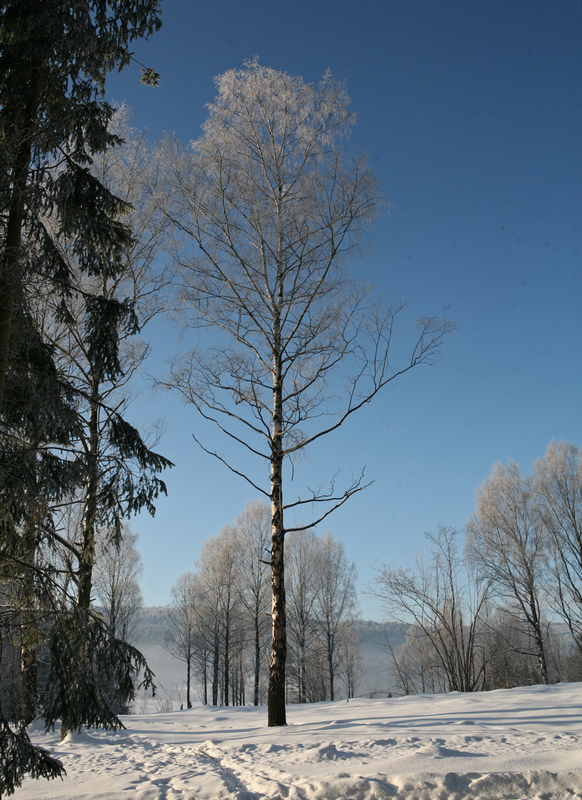 They left most of the birch trees; you can see them much better now. 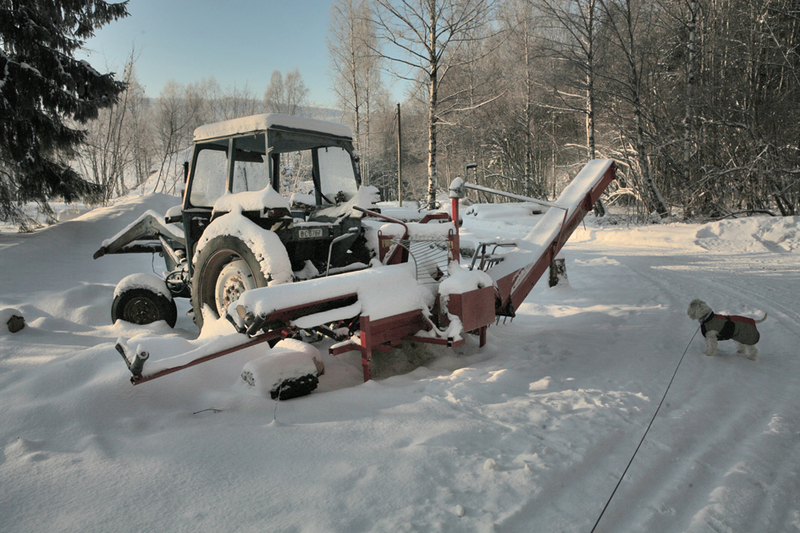 Before the snow, they were cutting firewood with this tractor attachment. We bought some for next year, you can’t really use it until it dries out properly. You can kind of see the mist on the horizon. There’s mist on the lake by our house too. After a large snowfall, a little machine from the local ski club comes chugging past making two sets of tracks for people to ski in. Having grown up in England I sometimes use the left hand tracks, but it’s easy to swap over if someone’s coming. it is strange, strange, how you bring back my “junior high school” days in Anchorage. I guess some things are universal, and others (arbitrarily) not. Yeah. I wanna ski down to the lake. Assuming that’s where the trail leads…. It goes right across. You can probably take it all the way to Anchorage. Nice pix as always, and I’m glad I don’t have to look at that fellow’s hairpiece any more. What a beautiful picture, this last one. One feels the urge to set on that path and walk to wherever it leads. The pix are beautiful and your stories always amaze me: what a tidy, organized country you live in! Making ski trails! Thinning the forrest! Here we barely plow the streets in the capital cities. Can’t you adopt us? Actually city street ploughing isn’t our best thing either and they get desperate to find new places to put all the old snow in Oslo. I say dump it in the fjord, what’s the big deal? But maybe I don’t get it. In NY everyone is responsible for cleaning the snow from the sidewalk in front of their own building,, which is a plan they could use in Oslo. Yes! I keep quoting that law here in Moscow. But no one listens to me. The trick is: you’re responsible for it (snore) and that means if someone falls and breaks their neck and sues you for 15 million dollars — you’re responsible (huh? what? say again?). We’ve got slippery snow over ice everywhere and I now know three people who have broken limbs. Lawsuits are terrible, but they do wake people up. I keep joking that Moscow has had meters of snow for millenia — wouldn’t you think they’d have learned how to deal with it by now? If it’s bad in Oslo, what about Helsinki? Hasn’t anyone gotten it right? Finns are very tough. Russians & Norwegians too. I think their idea of getting it right must be learning to ski at an early age. They do. Kids who can barely walk know how to ski. I’ve done it a couple of times and liked it, but never got into the habit. But I always grin enthusiastically at the folks hauling their skis on the metro to go to a park on the weekend. 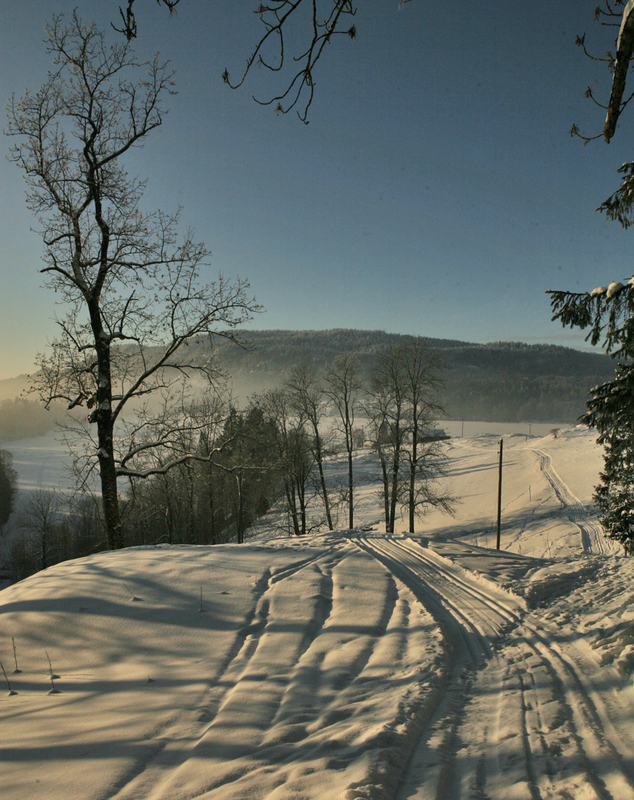 The Norwegians look forward to the snow, partly because it makes the landscape appear lighter and partly for the sports. It’s a good attitude, because it’s going to snow whether you like it or not, so it’s better if you can enjoy it. Dedicated young cross country skiers practice with roller skates during the summer on the roads to build up their stamina and muscles. Today I saw tiny kindergarten children sliding down hills on pieces of plastic. My god! We don’t get that. I wonder why not. Mab, you ought to always wear a crash helmet outside the house. I expect icicles mostly fall off in springtime. Just here it doesn’t get quite that cold, because we’re near the coast. Now it’s only varying between -3 and -18. 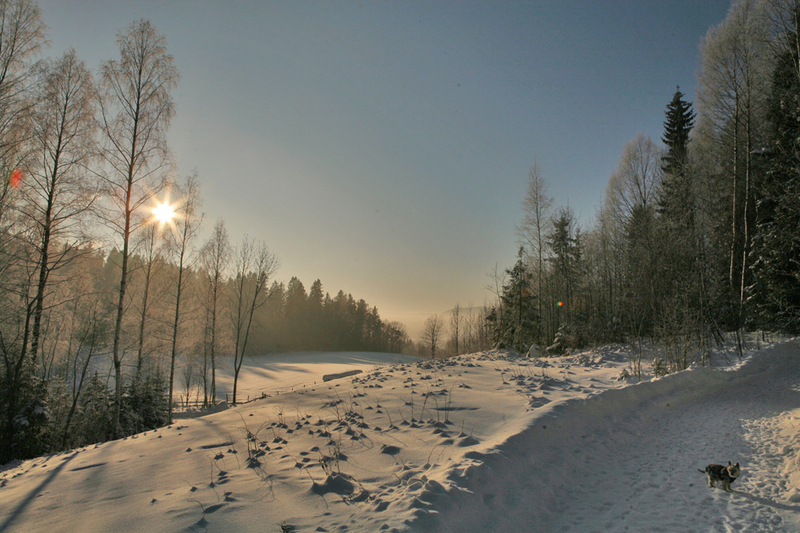 But if it’s going down to -30 in Moscow, I imagine it gets even colder in the countryside. Here in New England it’s not nearly that cold, of course — now or ever — but we can get big icicles. I haven’t noticed anything as massively as Mab describes, but even right on our house we have seen pretty big masses of multiple icicle. It depends on bad insulation and on cycles of snow, thaw, and refreezing, and also on how well or not well a building is insulated. We used to get an impressively Damocletian effect right by the door that we use all the time, but that corner is no longer as susceptible as it used to be to either ice formation or squirrels. A year or two ago, my daughter and I researched the possibility of assassinating people using bullets made of ice. We concluded that it didn’t work. We never thought of dropping an icicle on someone’s head, but as a murder weapon I expect it’s just as untraceable. You’d have to dress as a squirrel so no one knows it’s you, though — unless you often dress as a squirrel. We wish we could get some of the snow that’s clobbering the area around Washington DC; we haven’t been able to ski even once this winter. I think the problem we found (i.e. read about) was that the icicles when bullet-sized wouldn’t penetrate the skin much less go all the way through the body. I’d imagined the Berkshires as having as much snow as here.
. It depends on bad insulation and on cycles of snow, thaw, and refreezing, and also on how well or not well a building is insulated. Of course, it also depends on how badly or not badly the building is or is not insulated. And on the weather, too. Whether it has been snowing. Or not. And/or melting. Or did I mention that already? We’re not in the Berkshires any more but in the (consistently warmer) Pioneer Valley to the east, but even the Berkshires haven’t been getting much snow. It’s an odd winter. Vesla always looks like she’s smiling while the others merely gaze with Buddha-like serenity. Yes, this is a problem with not being able to hear their very different voices. Vesla’s is high. Holly’s is LOUD and Misty’s is deep and (if you’ll pardon the expression) hoarse. I’ll have to revise my image, then. Blimey, what’s next? Surfing in the Baltic. The Pioneer Valley is a region consisting of the three counties in Western Massachusetts through which the Connecticut River passes, and especially those towns that are in the lowlands of the Connecticut River Valley. A group of businessmen interested in promoting tourism gave the name to the region in 1939. With an independent bookstore in almost every town, several small publishers, and countless local authors, the Valley could well be counted as a reader’s paradise. So he moved to a reader’s paradise. Well, that figures. … Independent bookstores & publishers? Why there? Yes, I’ve written about the bookstores several times: 1 (the link’s gone bad, alas), 2, 3. I’m much more reconciled to being away from NYC than I was in Pittsfield (in the Berkshires; the only bookstore was a useless Barnes & Noble). Five colleges within a spit and a holler (as my folks used to say). Wow. I’ve never been anywhere near this area, but I wonder why I’d not even heard about it before now. The valley’s sweet corn and asparagus are considered, especially among New Englanders to be some of the world’s finest. Cow Corn, potatoes, and shade-grown tobacco are also major crops. Fields of all sort, particularly corn and tobacco fields, as well as numerous farmhouses and tobacco barns dot the landscape. Tobacco has to be dried under controlled conditions in tobacco barns (I presume). My parents knew a man who worked in the French state-controlled tobacco industry. He mentioned that the people who actually worked with the tobacco plants almost never caught respiratory illnesses such as the common cold or the flu. Just a few days ago I read something which seemed to imply the same thing, that it was not tobacco itself that was bad for the lungs but the fact that it was smoked. Tobacco is also bad for you if you chew or snuff it, so perhaps it is direct contact with the mucous membranes that causes cancer, but inhalation of something emitted by the plant while drying naturally might be beneficial to humans. Has anyone heard of this? Yes, on purpose, for proper ventilation. Same as for hay barns. “Controlled conditions” does not always mean expensive, supersensitive equipment. I spaced the panelling for ventilation when I made our hay loft. I think my wife told me to do so. I’d never heard that tobacco might emit something beneficial. I bolded “tobacco barns” because I had no idea that tobacco was grown as far north as Massachusetts. I thought it was only a southern thing. Shade tobacco is cultivated in Connecticut and Massachusetts. Early Connecticut colonists acquired from the Native Americans the habit of smoking tobacco in pipes, and began cultivating the plant commercially, even though the Puritans referred to it as the “evil weed”. The industry has weathered some major catastrophes, including a devastating hailstorm in 1929, and an epidemic of brown spot fungus in 2000, but is now in danger of disappearing altogether, given the value of the land to real estate speculators. I’m not sure the danger of their disappearance outweighs the danger of their non-disappearance . My Danish grandfather’s hay loft was outdoors next to the barn. I seem to remember a corrugated metal roof. It was lots of fun to climb on the hay bales and sometimes we even found an egg up there, although they weren’t good to eat since they weren’t picked regularly from there and the freshness couldn’t be guaranteed. I have heard a lot of the danger from tobacco comes from the additives, which are a secret of the tobacco industry. I remember smoking a cigarette in Germany that was quite pleasant and aromatic, something like pipe tobacco only milder, in comparison to American cigarettes which are pretty much a straight jolt of nicotine. I was surprised about the tobacco too when I moved here, but now I take it for granted. The barns are gorgeous. And the corn around here is the best I’ve ever eaten. I’m always a day late and a dollar short on these things, but: 1)if I remember correctly the book (but I hear, not the movie) The Lovely Bones ends with the killing of the villain by falling icicle; and 2) not long ago I saw a demonstration on-line somewhere (I cannot find it now) of an attractive machine for super-chilling cocktails with liquid nitrogen (a non-scientific-looking machine). I did worry about what happens when one’s lip touches the glass, though. But maybe if you super-froze those bullets?